The start of May marks the end of Golden Week, a cluster of national holidays that sends everyone packing on holidays near and far — mostly far — across the country and abroad. If you’re planning a visit to Japan, I strongly suggest avoiding traveling here during this period if at all possible. The last thing you want to do is be on the move when almost the whole of Japan is as well. Having said that, Tokyo (aside from popular attractions, like Tokyo Disneyland, etc) is pretty comfortable as most people have flown the coop. I leave Tokyo only if I absolutely must during this period. Anyway — the holidays only last through the first few days in May. Any time outside of that is going to be fantastic. It’s begun to warm up finally, but the dreary rainy season hasn't hit yet. This national holiday is pretty self-explanatory: it celebrates the day Japan’s new constitution that came into effect in 1947. No one really thinks much about its meaning — it’s a day off, after all — but some newspapers will take the opportunity to publish think pieces about the constitution, democracy, and so on. This holiday used to be on April 29th, marking the former Emperor Showa’s birthday while he reigned (1926-1988). Since his death, the holiday was renamed Greenery Day in honor of his love for nature and moved to May 4th. People are encouraged to explore Japan’s parks, gardens, and forests. If you need any suggestions on where to find some greenery, read on. Another holiday that has seen some changes over the years, Children’s Day was originally Boys’ Day. Times have changed though, and the holiday now celebrates all children — kind of. The carp streamers (koinobori) that are hung on balconies and outside windows now feature one carp per family member, instead of only for the boys. But, other elements of the holiday, such as the kabuto-style helmet displays, remain boys-only. For some seriously photogenic views, head to Tokyo Tower and Tokyo Skytree, as the areas surrounding the towers usually have hundreds of streamers on display for a week or so before and after the holiday. Because of all the national holidays during Golden Week, the beginning of May is an unofficial summer festival starting point, with several traditional and modern festivities on the calendar. Held at Katori Shrine in Koto-ku, this festival is a rare opportunity to catch a samurai procession marching through the streets of Tokyo. The festival’s origins date back to 940 (yes, that’s 940 and not 1940) when a samurai warrior named Fujiwara no Hidesato prayed for victory against insurgents heading the Taira no Masakado rebellion. After winning the battle, he gave his bow and arrow as an offering to the shrine. 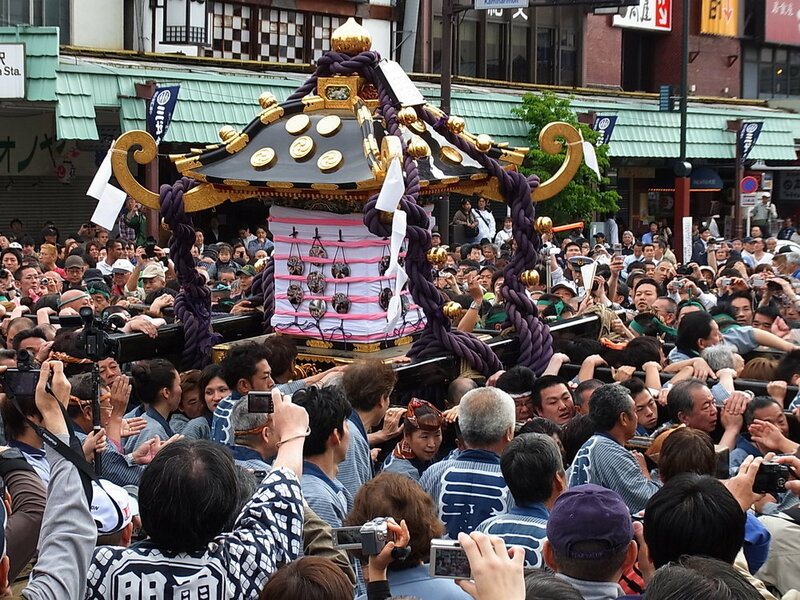 The festival takes its name from this event — kachiya (勝矢) literally means “victory arrow”. One of the big three festivals in Japan, this one is crazy. Seriously though, it’s so crowded and chaotic that you’ll come home drenched in sweat and most likely most of it won’t be yours. It takes place on the third full weekend of May every year and celebrates the three founders of Sensoji Temple. Hinokuma Hamanari, Hinokuma Takenari, and Hajino Nakatomo are enshrined in Asakusa Shrine next door. This commemoration of the 1941 opening of Tokyo port holds a host of fun activities and attractions for the whole family. The usual matsuri fare — yakitori and other foods on sticks — are all there. The highlight, though, is the Tokyo Fire Department’s presentation. The tricky thing about Tokyo in late spring/early summer is that the weather often changes from the frigid remnants of winter to the hot and humid throes of summer in a matter of days rather than weeks. This means that it can be hard to predict when certain flowers will bloom (cherry blossoms in early spring are notoriously finicky, for example). Even so, you should be able to catch these blossoms in early to mid-May. 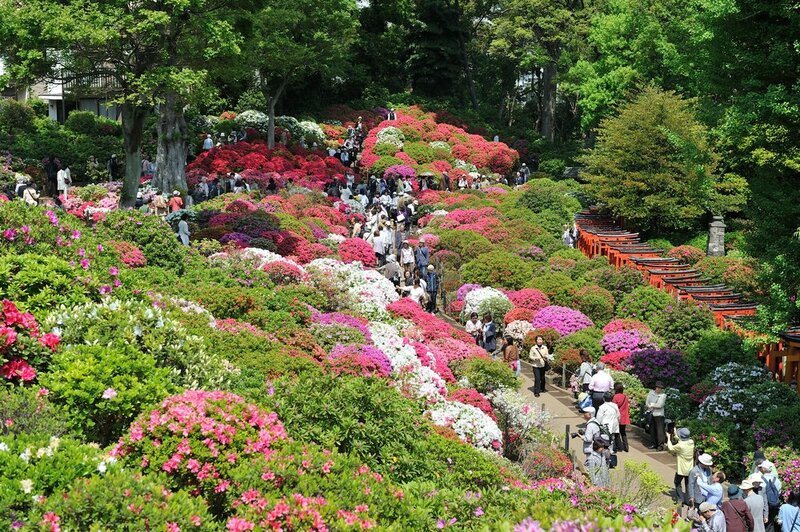 The azalea is a popular roadside bush in Tokyo — you’ll find them lined along main thoroughfares, down small alleys, and even in the occasional garden. The shrub is hardy and easy to care for and produces seemingly endless blooms of hot pink, baby pink, and white blossoms, making them a great choice to scatter across the city — the splashes of color are a great comfort after the cherry blossoms have abandoned us. Peonies were originally introduced to Japan in the Nara period (710-794) and were admired for being a noble flower that supposedly brought fortune and fame to their owners. Whether or not this is true, they are still admired for their beauty today. Though not as ubiquitous as the cherry blossom or azalea, you can still find these beautiful blossoms — usually in shrine or temple gardens. I love the heady perfume that floats from a canopy of wisteria. I love the way it climbs over wooden frames to create roofs and tunnels of deep purple (or white) for those unafraid of giant masses of pollen to walk underneath. Like azalea, it’s a hardy plant and can withstand the worst frosts and sudden heat waves Tokyo seems to get. A rose by any other name is still a rose, even in Japan. Wander around any residential streets and you’ll be sure to find a few of these in small garden spaces around people’s houses. You won’t find many of these thorny beauties outside of private gardens and the occasional rose garden in a park, making them all the more special when you do come across them. 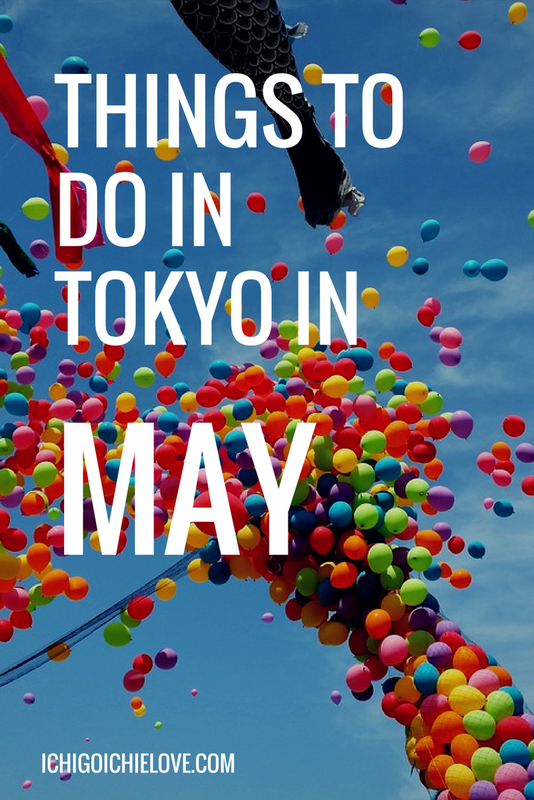 This is just a short list of some of the main festivals and events you’ll catch in Tokyo in May — hopefully, you'll find it useful!